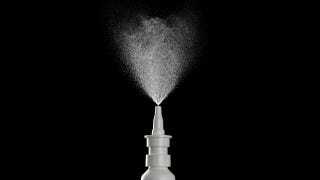 Could a Nasal Spray Really Make You Stop Wanting to Kill Yourself? Antidepressants are nothing new, but the U.S. Army is looking into a new way to deliver them. That’s why they gave the University of Indiana $3 million to work on an anti-suicide nasal spray. The active ingredient here is something called thyrotropin-releasing hormone (TRH), and it’s already shown promise in preventing suicides. The problem is figuring out how to get the stuff into the brain. TRH is able to help with suicidal urges, depression, and bipolar disorder, but as of now, the only effective way to treat people with it is by spinal tap. Nobody wants a spinal tap, especially people who are depressed and suicidal. Because of recent breakthroughs in nanoparticle delivery systems, the nose might be a viable entry point, which is why the Army has offered the funding (a pittance by military standards) to Indiana’s Dr. Michael Kubek to try and help the process along. If the spray works, it would be the most convenient and fast-acting antidepressant delivery mechanism out there.